Orchid and supply vendors also attend these shows, which makes them the perfect place to pick up some new plants and specialty supplies. Orchid shows are not just about shopping and viewing floral displays; many shows include lectures and demonstrations given by orchid experts. These talks are excellent opportunities to learn information about orchid care, new technologies and growing techniques in the orchid growing industry, and other orchid-related topics. Becoming a judge for an orchid show requires a lot of training. In particular, AOS judges don’t receive full certification for six to ten years! Upon acceptance, the trainee undertakes a three to five year training program, after which he or she is considered a “student judge.” Student judges are then allowed to judge at any AOS sponsored event, but they will not become fully certified for another three to five years. AOS-certified judges are required to continue their education and stay up to date on the latest developments by attending workshops and seminars. Points are given for each of these criteria and added up on a 100 point scale. Judges may also award other non-point based awards to orchids that are outstanding in certain ways. FCC (First Class Certificate): The highest flower quality award, given to species or hybrids that score 90 points. AM (Award of Merit): Given to species or hybrids that score 80-89 points. HCC (Highly Commended Certificate): Given to species or hybrids that score 75-79 points. CCE (Certificate of Cultural Excellence): Given to the exhibitor of a well-flowered specimen plant of robust health. The plant must score more than 90 points. Plants receiving this award represent the highest level of orchid culture. CCM (Certificate of Cultural Merit): Given to the exhibitor of a well-flowered specimen plant of robust health. The plant must score between 80-89 points. JC (Judges’ Commendation): Awarded to orchids that have distinctive characteristics that judges feel should be recognized but cannot be scored in the customary ways. AD (Award of Distinction) and AQ (Award of Quality): Recognize worthy new trends and improved quality, respectively. CBR (Certificate of Botanical Recognition): Awarded to rare and unusual species with educational interest that have not received any previous awards. CHM (Certificate of Horticultural Merit): Awarded to a well-grown and well-flowered species or natural hybrid with characteristics that contribute to the horticultural aspects of orchidology. 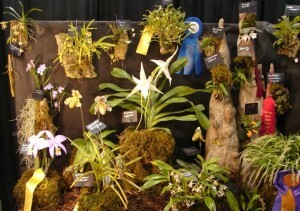 Orchid shows and expos are great places to become exposed to all things orchid. Whether you have been growing orchids for many years, or if you are just wanting to dip your toe into the wonderful world of orchids, these shows offer wonderful opportunities for expanding your knowledge while enjoying many gorgeous orchid displays. You may even decide to enter one of your own!